There's nothing like getting May's box in June...Oh Luxebox.... For such a large box, it was pretty light. Whenever I receive light boxes, I always say to myself, "Roh-oh!" And this was no exception. 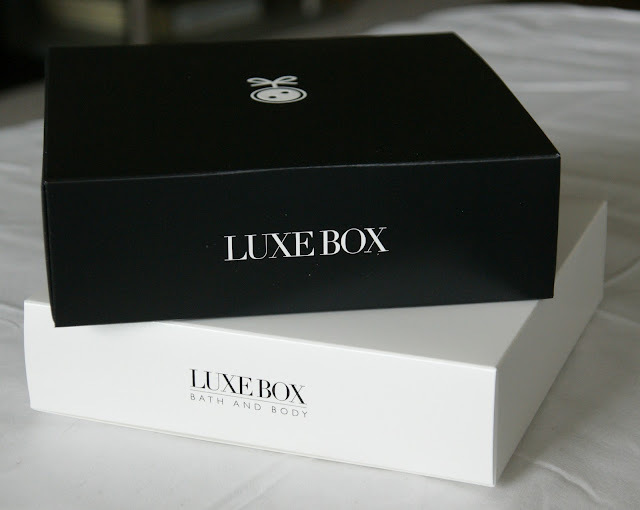 Though we received two boxes - the regular LuxeBox and a special Bath and Body box, the boxes still felt really light - like their were empty. Anyways, enough about that, I'm sure that you get my point...Here are the "goodies/baddies" that I received! Little shampoo packets will be the bane of my existence with these beauty boxes...This shampoo is supposed to gently cleanse and maintain your hair colour for visibly more brilliance and a natural feeling without weighing down the hair. Enhances the flow of water into skin cells, preserving and restoring hydration and the skin's youthful appearance. It moisturizes intensively, and ensures optimal and dynamic hydration. This is a pretty small sample that looks like is going to be a one time use...on a leg or arm. I probably won't be able to gauge whether or not I'll let this product. Full Size: 250ml ($105) <- WHAT???? Surely this is some sort of typo. I'm expecting my skin to turn to gold for this price! It is a muted lime green shade. Unfortunately, I already have this shade in a mini. I think that it's awesome that we've received full sized Essie polishes in the past two boxes, but it's not enough for me to want to keep my subscription. The lack of decent sized products in my boxes are really disappointing. Plus, I didn't even get a tracking number for this month's box. I knew that eventually, I would have to start unsubscribing to some of the boxes and I think that I've given LuxeBox enough chances to try and redeem themselves, and it's just not happening, unfortunately. 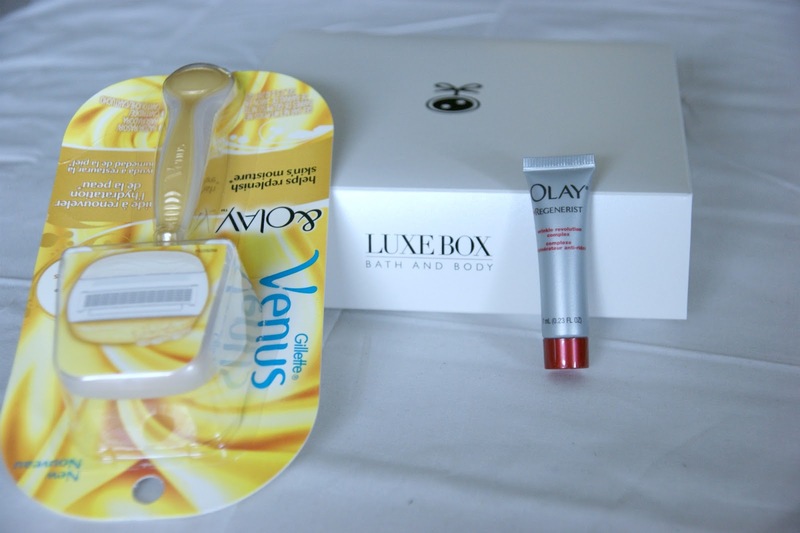 I think that is will be my second last LuxeBox (if I recall correctly, they've already charged me for June's - which is silly. They hadn't even shipped May's boxes and they've already charged for June's...). What did you think of your May LuxeBox? Were you happy or disappointed? After my disappointment with last month's box, I unsubscribed and May box is my last box. My box is similar to yours, instead of Goldwell shampoo and conditioner, I got the Joico repair treatment in a tube, and instead of the Essie nail polish, I got the Cargo lash activator. Happier with this months' box than last, I can't say I would want to keep my subscription. I know what you're saying. That's why I'm just letting it stop on its own (the credit card is about to expire) because I heard that trying to contact them is just horrible! I have been disappointment with a couple of my Lux Boxes. Me too. I hate feeling like I've wasted my money, which, given the past couple of boxes....I have been. Well, you saw what I got in mine and it was OK...I hate the Paco Rabanne stuff too...too strong! I wish I'd gotten the nail polish though, it's like Loose Button knows that I already have 250 bottles and are refusing to send any to me! I agree with Jayne, the scent was soo woody and strong..not the scent for me:( I was a tad disappointed because I received repeats this month...instead of the Essie Full size, I got a Cargo gloss..that's the one thing I loved out of my box. Will you be keeping your subscription? Unfortunately I have a year membership, I got for my birthday so I am just hoping that Loose Button amps up the next boxes!! Ps. I literally just spent 7 minutes trying to leave this comment because CAPTCHA won't load an image for me to type in to leave a comment. arrrgh! consider turning it off, this new CAPTCHA is uber annoying and buggy. haha thank you so much! I realllllly wanted to leave a comment and it wasn't loading the visual CAPTCHA image which was terrible. I unsubscribed from beauty subscription services a while ago, but I always liked it when they sent out Essie nail polishes ^^! Too bad you already have the colour! HI! Welcome to my little blog and thanks for following! Sorry to hear you already had that Essie colour - though it is definitely a pretty one! well thats a shame! I agree that they have been lacking lately in the samples department. I saw some other bloggers who got an essie polish in an uber cute pink colour but nope! none for me lol. And the price for the Orlane product is right. I looked it up online and the night cream I got in my box sells for right around $300! yikes. Thanks for following! thought I would return the favor! YIPES! That's such a steep price tag for those items! I mean, you can get La Mer products for that kind of money!!!! Thanks for the offer, but I have Tour De Finance in the mini (sigh!). Were you still interested in swapping Essie polishes from April's Luxe box? :) Let me know!